Abraham Kamber (b. 11/15/1892 - d. 10/3/1977), convinced his mother to let him leave Russia and emmigrate to America at the age of 13 in 1906. She insisted that his older brother, Dave, join him, and his younger brother, Harry follwed later. Abe saved his money as a young garment worker in Montreal, and then opened his own garment manufacturing business, Kamber Company, in New York City at the age of 21. His markets were New York, the Midwest through Dodge Clothes (Dave) and the Northeast though Kamber Clothes (Harry). Just before World War II, he began investing in real estate by syndicating partnerships. 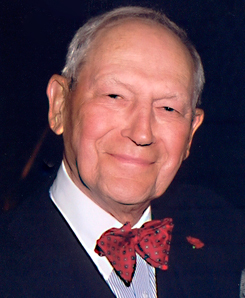 He financed and purchased properties from WIlliam Zeckendorf, Sr., Sam Field and Victor Cohen. His business partners included among others, Sam Lemberg, Abner Rosen and Stuart Gould, who appointed Abe Chairman of the Board of Gould Investors Trust. He amassed a portfolio that included One and Two Park Avenue, the Astor and Manhattan Hotels, 80 Broad Street, 370 Lexington Avenue, the Hearst Building, the leasehold at 1407 Broadway, Blair House on 58th Street and the Pathe Building on 106th Street as well as the Sherman Hotel in Chicago, the Lewis Tower in Philadelphia, and the Farmer's Bank Building in Pittsburgh. 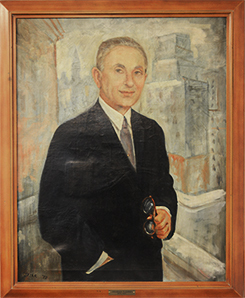 As a Philanthropist, he was a founder of United Jewish Appeal, also of the Albert Einstein College of Medicine at Yeshiva University and a major contributor to Brandeis University and the Weizmann Institute. In order to further his philanthropic goals, he established the Abraham Kamber Foundation which is active to this day. Stanley Herbert Levy (b. 4/11/1922 - d. 6/22/2011) was born in Brooklyn and attended Erasmus Hall. He graduated with a Bachelor of Arts degree from Cornell University in 1943 where he played Polo, and attained a Law Degree from Harvard Law School in 1949 after serving as a Second Lieutenant of in the United States Army's 42nd Division know as the Rainbow Division. He was trained as a pilot and flew as a spotter for the field artillery. In 1965, he formed the firm of Milberg and Levy (now Milberg LLP) with his partner, Larry Milberg. In the early 1970’s he left the firm he had helped found to run Abe’s real estate business as his father in law’s health was failing. He continued to practice law and manage the Kamber portfolio of interests through the early 1990’s. In philanthropy, he continued the strong dedication to Israel and the Jewish People that his father in law started.